The Pallet Truck provides high levels of durability and versatility simultaneously. Due to this it is one of the most used pieces of kit. In order to avoid disruptions to commerce, and to keep your equipment in pristine condition we advise a pallet truck maintenance routine. This will allow you to rely on them, safe in the knowledge you will not be caught out by failures and malfunctions with the truck. Due to extremely durable and hardy nature of the trucks these will be limited. However the implications and the impact of a malfunction on your commercial needs and requirements cannot be understated. To avoid these issues simply follow our pallet truck maintenance guidelines, to keep your trucks spick and span. Begin by inspecting the outside of the hydraulic unit for oil leaks and spills. Then test the unit. To do this simply load the truck then test the mechanisms functionality. This can be done easily by loading the truck with a heavy load, but not one which exceeds the trucks maximum load. Then let it stand for fifteen to twenty minutes. From this you will quickly be able to gauge the functionality of your truck. The type of oil which you use in the hydraulic unit is also very important. Make sure to use UNI-HO hydraulic oil. Try to avoid using automotive oil or hydraulic brake oil. Air Lock in Pump – to solve this problem put the control lever into the release position. Then manually pump the handle rapidly between ten to fifteen times. Or for a period of approximately five minutes. Low Fluid Level – put the jack into a lowered position. Then remove the filter plug. Using UNI-HO hydraulic oil, fill the oil reservoir in the unit until the oil level is equal to the maximum fill plug hole. Drain the whole unit, similar to bleeding a radiator. Restore the filter plug to its original position. Make sure the plug fits snugly, however be careful not to over-tighten. Check the machine over carefully. Looking for any structural problems, especially bent frame parts. The parts to be especially vigilant when inspecting are: lifting link and push rod. Any bent or damaged frame parts need to be replaced quickly. Equally the hand control may simply be out of adjustment and may require slightly tweaking. If any of these parts are damaged they will most likely need to be replaced. Handling Equipment Online provide a product warranty on all handling equipment and parts. 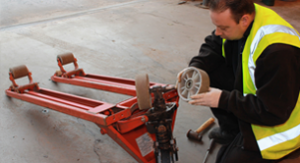 If you have any queries or concerns about pallet truck maintenance, please do not hesitate to contact our experienced technical team on 01384 895859. They are highly experienced and will be more than happy to assist you. This entry was posted in Equipment Maintenance and tagged pallet truck maintenance on May 30, 2013 by admin.